I have been asked to describe the late Sufi Master, Ahmet Kayhan. This leaves me in something of a quandary. I, who am rarely at a loss for words, am this time muted into agonizing silence--agonizing because, as I tell the truth, I shall strain people's credulity and may be accused of exaggeration. How shall I begin to tell the story of a man who literally defies description? If there is one thing all the thousands of people--from the most diverse backgrounds--who have been graced with his presence would probably agree upon, it is that the Master ("Effendi," in Turkish) is indescribable. I have consulted some friends who knew him, and they all shook their heads sadly, knowing that the attempt was impossible. The task that stands before me, then, is to assume the role of a Fair Witness (as described in Robert Heinlein's Stranger in a Strange Land: "The house looks yellow on this side") and submit my account as truthfully and sincerely as I know how. To those who disbelieve, let me say in advance that I don't blame them one bit. The trouble is that this account comes to your doorstep just a trifle too late, for it was only recently that we watched helplessly as his life, like water, slowly but surely trickled away through our fingers. The only way to verify my story was to come and see for yourself. Now that the only sure-fire means of verification are no longer in our hands, people will be entirely justified in their skepticism. The question might also arise as to how reliable, how objective and impartial, a humble and devoted student of the Master may be, a person who has known him for two decades, and has been able to observe him at close quarters, under the closest circumstances, for 15 years. The answer is: more reliable than you might think. For it is not only a privilege for me to write about the Master; it is also a duty, and this duty can brook no untruth. The slightest deviation from the truth--the slightest misrepresentation--in explaining such a person to the world at large would, to my mind, be fraught with dire consequences. I shall do my best to abide by the ideal of a fair witness, and with the help of God I hope to be as successful as I am humanly able to. But do not forget: what I am going to tell you is an almost illegible replica of the truth, watered down, as it were, to the concentration levels of a homeopathic solution. I doubt that the scarcely discernible traces on this paper will give you much more than the barest inkling of that staggering reality. And I fully accept in advance that the failure to communicate is my shortcoming, not yours. 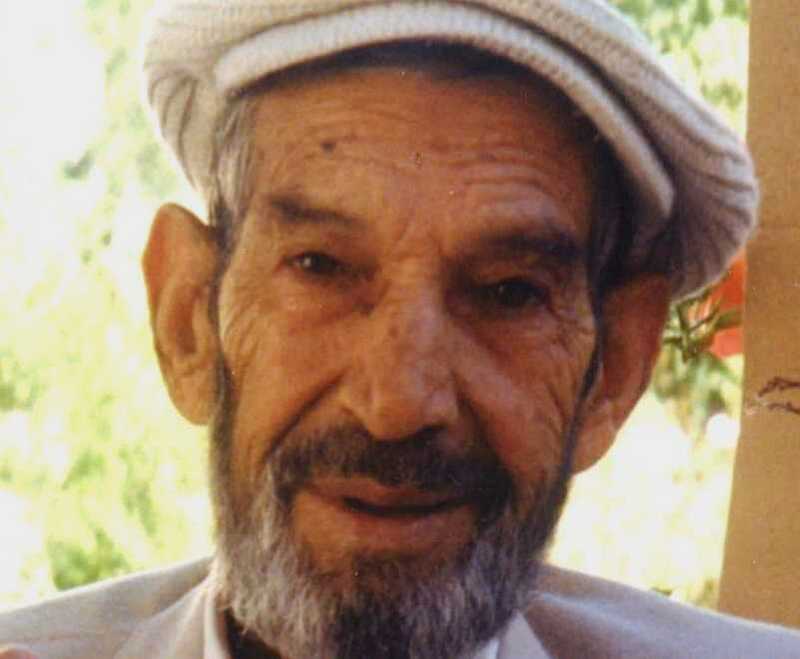 The humility of Grandpa (as those who loved him called him--other epithets were "Father," "Father Ahmet," or "Grandpa Kayhan") is the reason why he did not like to advertise himself. I've been told, for example, that in 1982, he was visited by a Canadian journalist who was so impressed by what he saw that he said to the Master: "Let me publicize you. To the Jews, let me go and say: 'If you're looking for Moses, here he is.' To the Christians, let me pronounce: 'I've discovered Jesus.' And to the Moslems let me say, 'Here is Mohammed.'" The Master refused, and the journalist respected him enough to comply with his wish to remain unexposed. He could have become world-famous, had he so wished. The bare bones of the Master's biography are quickly told. The closest I can make out is that he was born in early 1898. Since he died on August 3, 1998, he was a hundred years and seven months old when he passed away. On his ID papers, his birthdate is given as 1905 (1321, reckoned by the lunar calendar which was then in use). Because vital statistics were not conscientiously collected in those years, however, he was registered together with his half-brother when the latter was born several years after him. His birthplace was the small village of Mako (Aktarla, as it is now known) near Poturge in the province of Malatya. He lost his father when he was only a year old. His mother remarried, but died when he was seven. * After that, he stayed with an aunt for a while. Even at an early age, stories are told that indicate he was brave and under divine protection, perhaps supporting the claim that sages are born and not made. (They're both born and made, actually; we can't neglect either face of the nature/nurture coin.) He was only 4 or 5 years old when he first met, and was extremely impressed by, his Master (Keko). When the last Sultan departed from Istanbul on a ship (November 17, 1922), he was there by chance to witness the occasion. From then on, he would shuttle often between the large cities of Istanbul in the west or Ankara in Central Anatolia and Malatya in the east, for it was in the village called Ali Bey near Izol (in Malatya) that Keko resided. After 1980, I began to attend the Master's discussion groups more frequently. From the beginning of September 1983, excluding normal working hours or vacations, I had the incredible good fortune to be almost continually in the presence of the Master until his death. He would quickly discover the forte-- the strongest virtue--of a person. He once told me that only a moment was enough for a true murshid (Islamic guru) to take the snapshot of a person--I'm inclined to call it a kind of spiritual X-ray. He would then cultivate that virtue of the person, also supplementing this with whatever "vitamins" were deficient in a student's constitution. The Master had no formal organization to speak of. Although he was in the Naqshbandi line of descent, there were no dervish convents (takkas), no ceremonies, no special rituals, and no formalities. The convents had been disbanded in 1928 by the newly-formed Turkish Republic, but with the Master I learned that there was no need of them. True spirituality could be exercised and conveyed without any formal structure at all--all that was necessary was acceptance on the part of the teacher, and devotion, sincerity and effort on the part of the student. Having served their purpose, the takkas had passed into history as defunct sociological institutions. Some of the things he said and did were eminently logical and reasonable. Yet other things he said would be impervious to comprehension, no matter how hard one exerted oneself. Some of the things he said would become comprehensible some time later, as events took their course. Other things could take years before you were able to decipher them. As historian Paul Johnson has noted of Jesus' utterances in a similar context, the Master was a complicated man and sometimes spoke in a complicated way. His granddaughter, who had been with her grandparents almost from her birth, once told me that it was hard to figure out what made him tick. I don't believe anyone ever figured him out. Whatever this secret was, it went with him to the grave. Of necessity, this approach also precludes the possibility of conducting any scientific research "on" the Master. Suggest the idea to the least of his visitors, and they would have thought you were out of your mind. Even the idea of hooking up EEGs and predicting cards smacks of sacrilege and is tantamount to reducing their subject to the status of a mere psychic. Doctors inspecting the Master's anatomy years ago came to the conclusion that he should be clinically dead. What further miracle could one need? In order to travel this course, three things are needed: a job, a spouse, and faith. Notice that these correspond to the three requrements above: a job provides honest income, a spouse means a home, a family and a healthy sexual relationship, and one wouldn't perform the daily Formal Prayers without faith. In Science, Knowledge, and Sufism, I have tried to demonstrate that Formal Prayer is greater than all the major forms of Yoga combined, and so shall not here elaborate on this further. The departure of the Master left us all with a feeling, a tremendous sense of loss. How could he be replaced? The search for a successor started almost immediately. The Master, however, had already indicated during his health that he would leave no single successor. Rather, he said, "I will leave a thousand Ahmet Kayhans, ten thousand Ahmet Kayhans." The meaning of these words is clear. His presence lives on in us all. All of us must now try to follow the Master's radiant path in our lives, and we all must try to show others why that path is so wonderful. Our task is a difficult one. Only time will tell how successful we will be. *Addendum: Apparently, she lived until he was 14 or 15.